Eva Lee, in conjunction with Memorial Sloan-Kettering Cancer Center, designed a real-time intraoperative planning system that improves the survival rate of patients with prostate cancer, and reduces costs to the healthcare system. 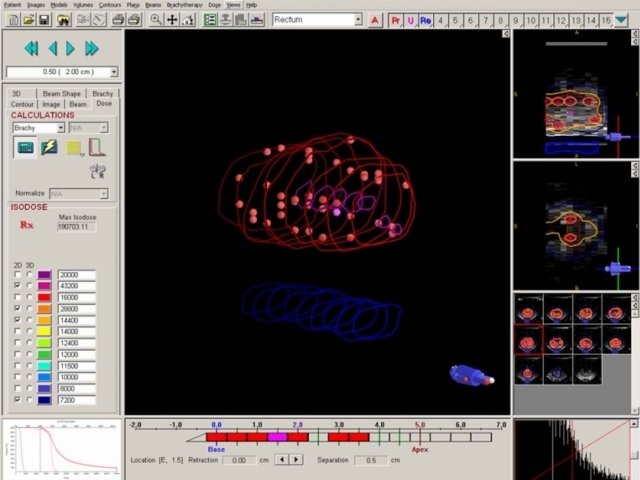 This figure shows the improved 3-D seed location inside the prostate as determined by the operations-based treatment planning systems they developed. Faculty and students at ISyE are developing, applying, and disseminating advanced science and evidence-based approaches to improving health care systems and patient care, prevention of disease, public health decisions, and humanitarian systems within the U.S. and abroad through a variety of research activities. Our long-standing strengths across methodological areas are integrated with extensive knowledge of the domain and strong private and public partnerships to transform health and humanitarian systems, leading to new methods and analytical approaches, and positively affecting individual patients, population health, and health systems; as well as humanitarian systems (from disasters to development). The availability of data has risen exponentially. This data lays the foundation for improvements across health and humanitarian systems, including decisions at a variety of different levels. Research in health and humanitarian systems relates closely with many areas across ISyE, including methodology areas (e.g., simulation, optimization, and statistics) and application areas (e.g., supply chain engineering, analytics, and machine learning). Developing patient-centered solutions: Decision support tools for catch-up vaccination scheduling for children and adults or optimizing radiation treatment for tumors. Informing clinician decisions: Clinician guidance on which patients are at greater risk for nonconvulsive epileptic seizures using statistical techniques. Optimizing health care operations: Improving patient flow in clinic or hospitals, scheduling of medical residents, staffing decisions for nurse call centers, planning for disaster response in public health. Designing health networks: Optimizing sites for telemedicine to improve health care access or balance cost and equity over the system. Evaluating or informing policies: Evaluating the impact of school closures during an influenza pandemic, identifying areas with highest levels of childhood obesity, quantifying status quo of utilization and pathways of services, interventions to treat or prevent disease, analysis of expenditures. 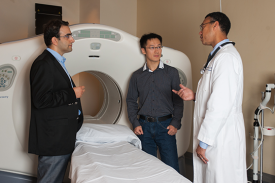 Turgay Ayer and Ph.D. student Qiushi Chen have been collaborating with Dr. Flowers, an oncologist from the Emory University Winship Cancer Institute, on evaluating different treatment strategies for lymphoma and colorectal cancers. Nicoleta Serban and Julie Swann co-founded the Health Analytics group on campus to help improve decision making in health care. Pinar Keskinocak, Faramroze Engineer, Ph.D. 2009, and Larry Pickering, executive secretary of the ACIP of CDC, collaborated on the creation of the childhood vaccination catch-up scheduler.